Storing away the submachine gun into the attachment case with one hand, she shouted through the transmitter. Certainly, under that sort of circumstances the race of Touma Mato was troubled. The snow had piled up to twenty centimeters over the asphalt surface, which demanded a great strength to run across. Six minutes exactly until destination. With a speed that would make any athlete blush, she crosses the six-lane road. 200 meters ran through the parking lot; after struggling she finally reaches the entrance of the amusement park someone allegedly destroyed. She retrieves a gun from the case as the situation may call for it in a matter of seconds. No time to look at the situation at leisure. …Although unbelievable, the are still figures of people in the burnt third floor. Tougo Kisara, perhaps the suspicious figure of earlier. Be that as it may, as long as she didn’t explore the building she will not progress. Moving from any potential hiding place to another. Touma Mato wholeheartedly focuses while keeping a perfect vigilance, and then rushes in quickly. From the entrance to first floor, from the first floor to the stairs and from the stairs towards the second floor. There’s still some distance until the stairs leading to the third floor. Marching in a straight line she’s now aiming. She makes a detour through the large cabinets destroyed by the explosive wave and whatever could be lurking within, and then arrives at the stairs leading to the third floor. When suddenly, a voice from the third floor resonated. Quickly ascending the stairs with dexterity, Touma Mato pointed the muzzle of her gun around entire floor, ready for action. As if to exchange positions with her, a large and black human makes a runup and jumps outside. Though the impulse of chasing after him right away was overwhelming, there was a person to be saved. Touma Mato rescued the injured girl and accompanied her until the middle of the parking lot, from here on she will instruct the girl how to make an escape on her own. And thus, resuming her chase, she exited the amusement park for the second time. The black silhouette of just a moment ago is nowhere to be seen in the surroundings. They have not passed each other and two minutes　had not yet passed. It was impossible for him to have vanished from her field of view. If that is the case— there is no need to ponder about it, the suspect could’ve only gone to one place. The basement of the amusement park. The culprit is likely to have gone to the parking lot in the basement to rob a car as means to escape. Both the exit and entrance to the parking lot in the basement are located in the east side of the building. …by that time the footprints of one person showed who was on the lead. The figure to chase has reached the entrance, killed (erased?) his footprints and descended the hill road towards the parking lot. Then, her eyes catched the view of the open space of the underground parking lot of approximately 50 meters. The time it took for Touma Mato to move on to the next course of action was of one second only. The interior of the parking lot. Who knows how many cars were lined up inside, and where a single man could be standing. The suspect wearing a black coat. Exactly in the entrance—with its back to Touma Mato— a burning man appeared. A beaten human. It is probably Tougo Kisara. Her body was scorching. As if smoldering. With little flames slowly flickering, like a candle. One second after the confirmation; no, actually in half a second. Touma Mato reached for the belt in her waist and removed the lid of the spray can and threw it at feet of the man before her. A throw of approximately 30 meters. As soon as this occurred the woman stealthily entered a car nearby, covered her eyelids with her hand and looked away. A light capable of burning retinas and a sound so strenuous as to numb eardrums ran through the parking lot. It prepares the suspect for arrest. The standard employed against terrorists. This hand grenade has as its target rendering the criminal defenseless through the lost of subject’s vision and audition. It dispossess of the vision from the other party with an intense light. This light not only steals the vision, but also extends its effects to provoke a shock (damage) to the brain, and induces vomit and confusion. A harmful sound. In reality, the grand volume of the sound numbs the sense of hearing to the extent of making the body collapse, and for a few minutes, leaves the target in a soundless condition. It robs the will to fight of the criminal and guarantees the safety of hostages, a suppression weapon. Had this been an unexperienced user, his impossibility at fighting would most likely had him been hit by the light and sound simultaneously. At that instant, she confirmed the figure of a man protecting his eyes with one hand. 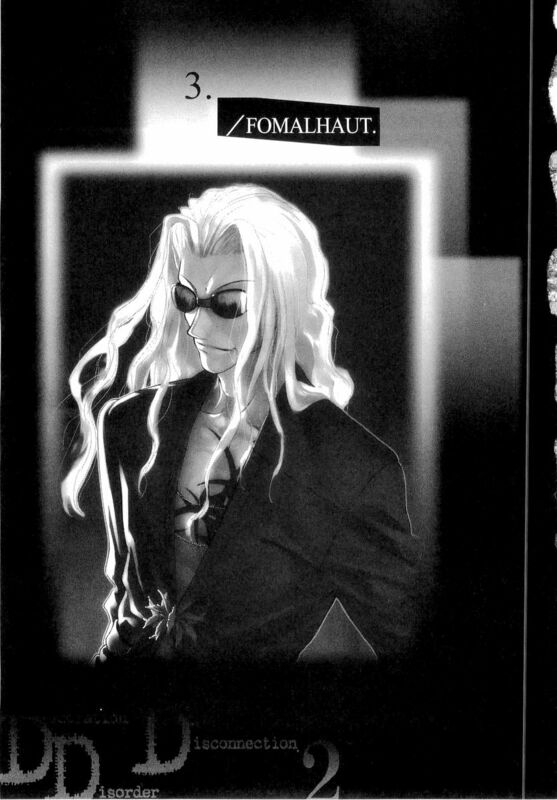 Touma Mato had no way to know, that the black coat— Hinomori Shuusei wore mirrored sunglasses. His sunglasses protected his eyelids, and he even covered them with his arm. The lost of his vision was close to null. However, only this persona’s ears lacked protection. In one hand he was holding a katana and with the other protected his eyes. He could not cover his ears. The flash bomb disturbed the man’s sense of hearing, he was driven into a state where he could not hear a sound. The human trapped into the sudden silence. He has lost judgment. Even though he could see, he could not listen. ”That should be enough”, Touma Mato pulled the trigger. A quiet action contrasting the flash bomb. Its killing potentional clearly surpasses in sheer violence to bring down the black coat. MP5. This, too is used to combat terrorist and became the standard of supression weapons. It was the norm even among the police and said to be an excellent submachine-gun. This here is a translation practice, so don’t expect it to sound flawless and be 100% accurate. Or well accommodated, I’m too lazy for that. This entry was posted in Random and tagged cokesakto disciple, DDD, Decoration Disorder Disconnection, FOMALHAUT, Hinomori Shuusei, Tomato, Touma Mato, translation practice. Bookmark the permalink. Yesh, deliver DDD from the Cyrillic tyranny. Yep. I usually check the blog every couple of days but this flew totally under my radar.